“You really have to watch where you’re walking. Are you okay?” Dustin replied. Immediately upon arriving home, the work of creating an effective homemade anti-itch cream began. I tried several formulas, all while fervently itching my battle wounds (it’s a good things I keep DIY recipes simple). I began mixing bentonite clay (to draw out any nasties from the bites and heal my skin), baking soda (to neutralize acid and soothe itching), witch hazel (to reduce pain and itching), and coconut oil (hey, I was making some raw brownies, so…). My first two creations were anything but desirable. The coconut melted on my warm skin, and soon bentonite clay was being tracked throughout our house. Good thing we’re in the middle of a giant construction zone/kitchen remodel. The second creation wasn’t much better. Reducing the coconut oil created an unpleasant dry powder. The third attempt resulted in sweet success. The addition of shea butter, one of my favorite DIY ingredients, helped the anti-itch solution stick to my warm skin and, working with the other key ingredients, reduced my painful itching. Not only did the third cream-based solution reduce my itching, it also appeared to help clear my bites and reduce their size. My discovery was so exciting, I made multiple batches to share with family and friends–“Oh, okay. Thank you for another mason jar.” They’ll get me someday. 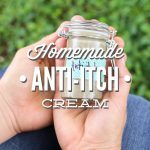 Homemade anti-itch cream takes just a few minutes to make and only requires simple, natural ingredients you can actually pronounce. Because each ingredient is shelf-stable, the cream can be made in advance, so it’s ready to be used the moment a bug or plant attacks. Before we part ways today, I think it’s only appropriate to give credit where credit and inspiration are due. Thank you flesh-eating ant colony, I owe this DIY to you! 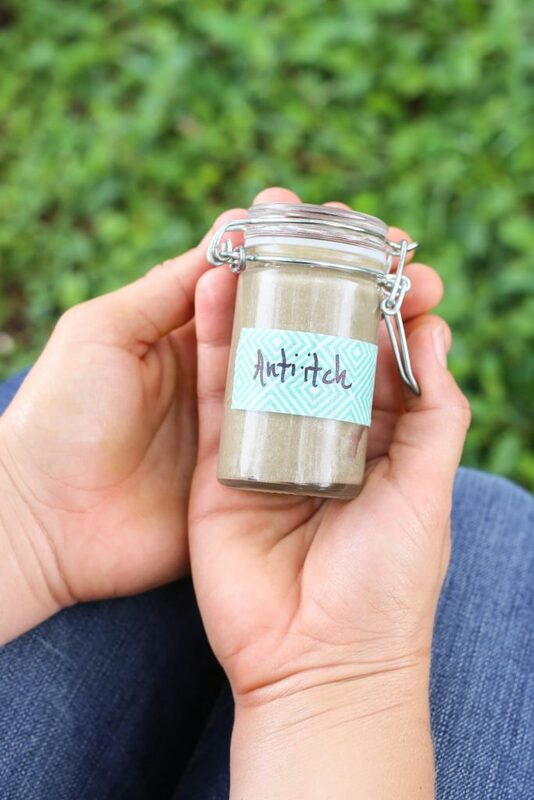 Homemade anti-itch cream takes just a few minutes to make and only requires simple, natural ingredients you can actually pronounce. 1 TB coconut oil A different nourishing skin oil (olive oil, jojoba, etc.) may be used, if needed. 1 TB dried calendula Calendula is often sold in the bulk spice section at many health food stores. In a double broiler (or a pot filled a quarter of the way full with water and a heat-safe bowl over the top), melt the coconut oil. Add the dried calendula. Place a lid over the top of the double broiler. Over medium heat, infuse the herbs in the oil for 30 minutes. Separate the herbs from the oil by straining the oil through a fine mesh sieve. Discard the calendula (or compost in a garden). Wipe the double broiler to remove any leftover herbs. Return the infused oil to the double broiler. Bring the heat back to medium-high (enough to get the water underneath boiling). 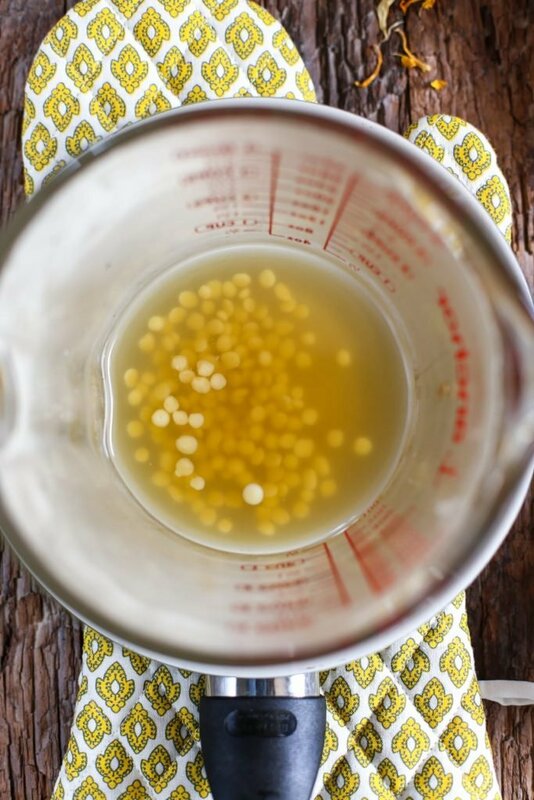 Add the shea butter and beeswax to the infused oil, and stir until melted. Remove the pan bowl from the heat. Add the baking soda and benonite clay to the liquid, and stir until the mixture resemble mud (really, mud!). Add the witch hazel and essential oils, stirring to combine. Pour the cream into a jar (this recipe will make enough to fill a 4-ounce jar). Within minutes the cream will solidify into a spreadable lotion. 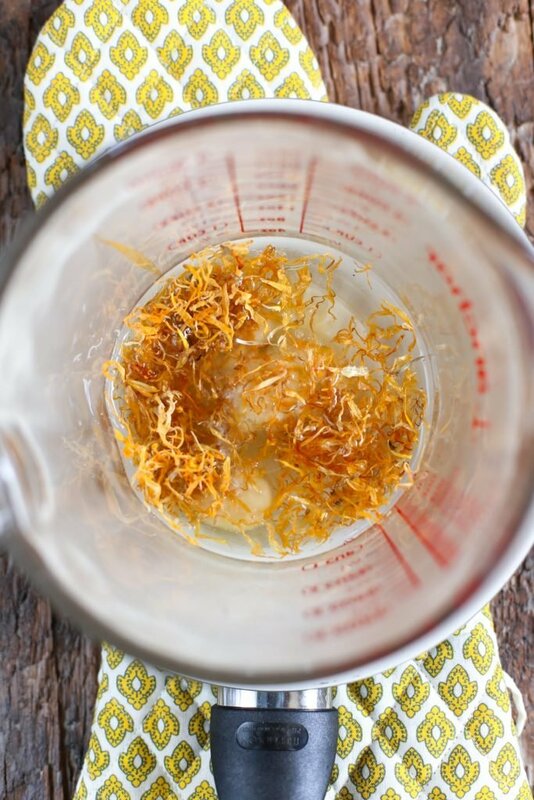 *Dried calendula is optional in this recipe. Calendula is infused into the oil for a healing addition; however, a perfectly good anti-itch cream may be created without this herb. PS: If you’re wondering what’s up with the yellow dye on my left hand, I juiced turmeric the morning of this photoshoot. I’m thinking this would make a great diaper rash cream too. What do ya think? Hey Bethany, To make a diaper rash cream, I would leave out the essential oils and witch hazel. 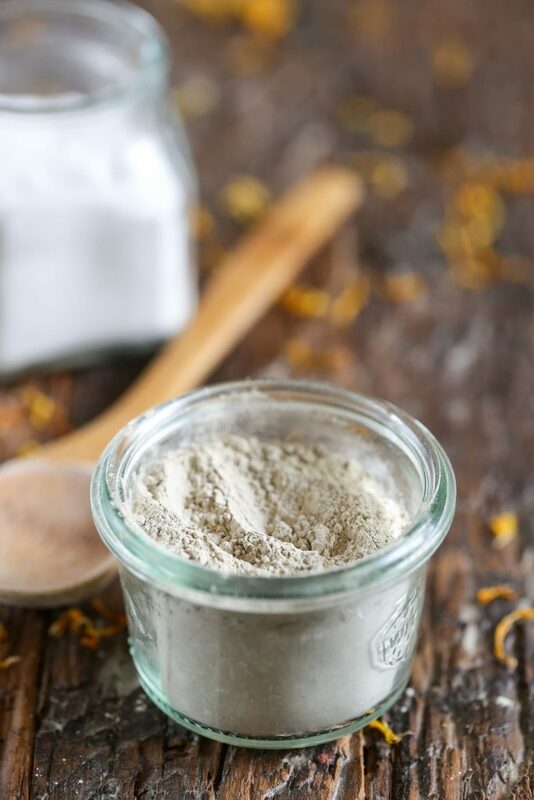 The other main ingredients would be a great combo for a homemade diaper rash cream–I used to make a very similar version of this, along with a bit of non-nano zinc oxide, when my kiddos were babies. I should post the recipe at some point ;). That would be so fantastic, so many icky ingreds in store-bought creams. What about for an allergic itchy doggy’s skin? Hey Sasha, I’m not sure. I don’t have much experience with dogs and itchy skin. I would probably look at the root problem–maybe food, an irritant, etc? For itchy cat skin where she scratched herself due to fleas I made a salve that works well on her and can be used for itchy skin on us too. Would be good for dogs also. Melt beeswax first in double boiler add others. Pour into jar, let cool. Can you use colloidal oatmeal in place of the clay? 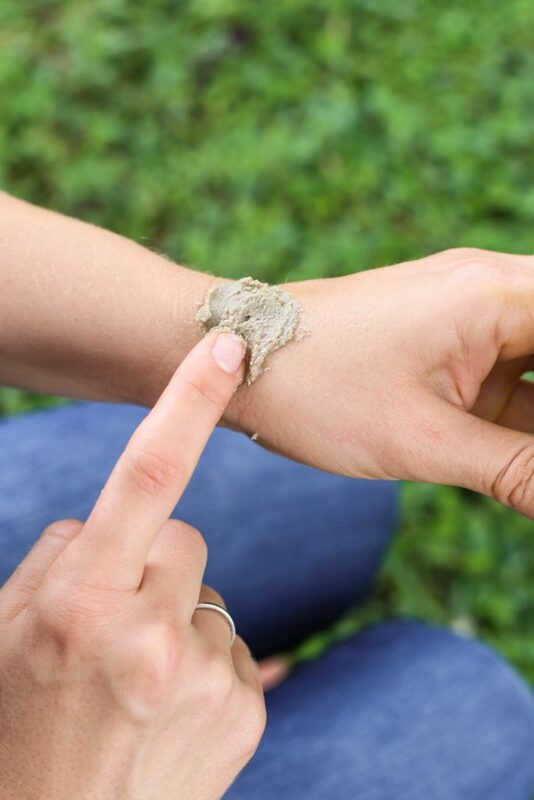 Hey Stephanie, The clay helps draw out any nasties in the bug bite and relieve itching. I’ve never experimented with colloidal oatmeal in this recipe, but based on my research of the benefits of oatmeal, using it in place of the clay may work. The oatmeal won’t draw anything out of the bites, but it should help soothe and relieve the itching. Let me know if you try it! I have been making a simple salve using calendula, plantain, and papaya for 20 years now. It’s excellent for bug bites and other skin irritations. The most shelf-stable way to add papaya is to grind the papaya tablets you can find in the health food store into a powder. Even dried, actual papaya fruit had too much moisture and invited mold into the mixture. I do find that the plantain works better fresh than dried, so I wilt the leaves on my countertop overnight before starting an infused oil with the wilted plantain and dried calendula. I do a 48-hour heated infusion with the oils and herbs in a capped jar set in a crockpot water bath. After straining the finished oil, I add the papaya powder and stir until it dissolves before adding a bit of beeswax to firm up the finished texture a bit. I might try adding some bentonite, too! Hey Makalove, Your recipe sounds wonderful! I love to use the crock-pot for herbal infusions, too. I’m so thankful for modern-day appliances that make this natural lifestyle so much easier. Thank you for sharing! I’ve been looking for a good bug bite/itch cream…can’t wait to try this one. I already have some olive oil infused with calendula, chamomile and comfrey and I just bought a new witch hazel. I have some coco butter though instead of shea butter so i’ll see how that works. Does the peppermint oil make it feel cooling on the skin? Thanks for sharing Kristin!! Awesome, Cathy! I’m so glad to help–thank you ant colony ;). The peppermint is added to help reduce the itching. I think cocoa butter will work very well as a shea replacement. Enjoy! Awesome recipe and cannot wait to try! I am wondering if you could suggest another essential oil instead of tea tree though? Thank you, AmckayRN! 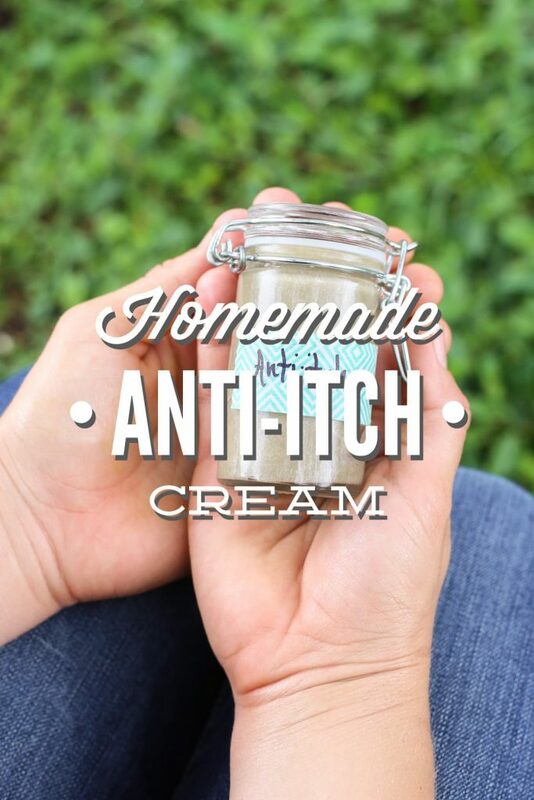 You can leave the tree oil out of the recipe and still make a great anti-itch cream. If you’d like to replace it, I recommend either lavender or geranium. Enjoy! I just saw another recipe for poison ivy salve using half bentonite clay and half ACV. You were supposed to leave it own for about 15 minutes or so then rinse off. I really like your recipe as it seems to have more helpful ingredients. I was wondering if you need to wash this off as well. Hey Danielle, I bet you could use apple cider vinegar in place of the witch hazel. Great idea!! I recently discovered I have a sensitivity/allergy to bees wax. Think hives and sores at point of contact. Could this ingredient be left out or is there an alternative I could use instead? Thanks for the recipe – I just mixed it up this morning and tried it out on mosquito bug bites. I’m not actually finding much relief though, and I look kind of “freakish” with mud caked to my leg…lol! I might try adding more Peppermint EO because I’m not feeling any cooling effect, which I assume would help provide more relief. If you have any extra tips that you found, I’d be super grateful :). Did you find this to be effective as is, for your family? Hey Laura, Yes, we use it as is to help reduce the itching. After a few minutes the cream should completely eliminate the itch. You could also try applying a small amount of apple cider vinegar to the bites or straight witch hazel or rubbing alcohol before applying the cream. The peppermint measurement can definitely be safely increased in this recipe. I hope it starts helping soon :). Let me know how it goes! It sounds like you’ve already done this, but make sure the application is very thick. You can also safely apply more as needed. Thanks for the extra help, Kristin! I will try the extra tips! It did eventually stop itching after I wiped it away (had it on about an hour?? ), but while I can be patient, I’m not sure if the kiddos can ;). I also found that while I tried to be very careful, I still got it on my clothing, as it doesn’t harden/dry out…which was a bit messy. But still…I haven’t itched since wiping it off…that is a plus! 🙂 Thanks again! Oh good! I’m glad the itching went away after an hour ;). Some bites may require the extra power of the direct witch hazel, etc. I’ve used the anti-itch cream now on everything from rashes to ant bites, and found some mosquito bites in particular are just super stubborn. Great follow-up to report! Bites are especially bad this year, so we’ve had plenty of opportunities to use this for the fam. The kids affectionately now call this the “mud” Mommy made…lol. We have doubled the peppermint EO and like that much better. 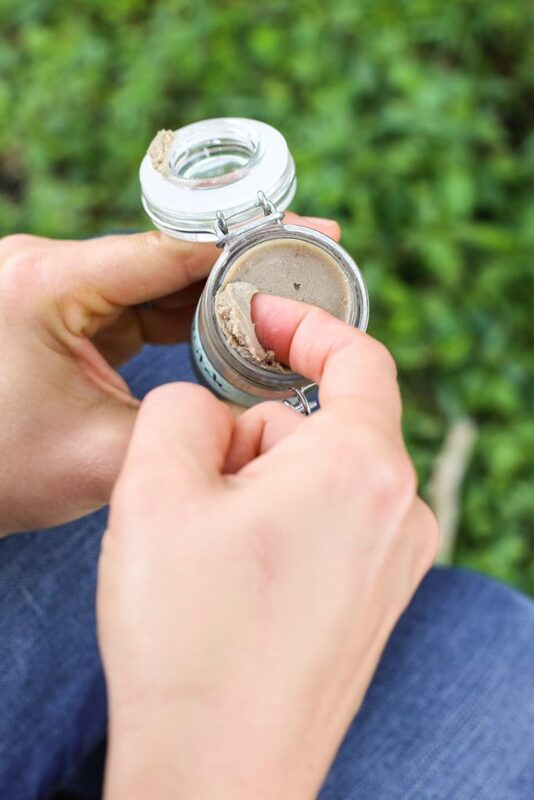 We’ve also found if we treat the bites right away or as soon as possible (easier to use at home), and leave it on 30-60 minutes before wiping off, then the mosquito bites do NOT bother us again, even though we see them for a few more days…no itching comes back! Thanks so much for this recipe! I’m definitely sharing it! That’s awesome, Laura! Thank you for reporting back. I love that your kids call this “mud”…lol, very appropriate ;). With the clay and baking soda, this doesn’t sink in to the skin, but lies on top, correct? Hey Melissa, Yes, that’s correct. It will form a dry paste on the skin. I’m looking at recipes for an anti itch cream, and made one similar to this but without the waxes and butters, just a paste. Without sharing TMI, I need this for a delicate area that itches INSANELY from a systemic candida infection. This burnt horribly for several minutes, and still stings, but the good news is the itch is mostly gone. Have you any ideas for a cream for use on tender, delicate areas that could use a calming, anti itch cream? Hey Carol, Just plain witch hazel may be effective. I haven’t tried it in sensitive areas like that, but it might work in a spray bottle diluted with some water or even chamomile tea. I truly wished I lived near you and fell into the category of “friends and neighbors who receive mason jars” from you on a regular basis. I would be worshiping the group you walk upon. Currently, I’m not in a position to buy the raw ingredients to make much of anything, but I keeping the recipes for a time when (or if) our financial situation improves. Then, I plan to begin making many, many of our household and beauty/grooming products from your recipes. I can dream, right? Hey Michelle, There are definitely benefits to living in the same neighborhood ;). 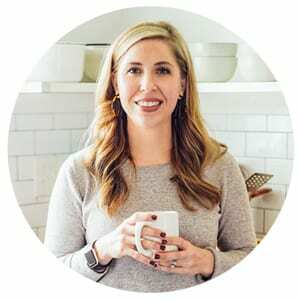 Creating homemade products definitely requires a larger financial commitment up front, but overtime, I’ve found that multiple products can be used multiple ways (here’s a good video about this concept: https://www.youtube.com/watch?v=Jf92QBRvJIo. So in the end creating a select number of necessary homemade products actually saves money. I’m always here to answer any questions when the time comes to get started :). Hi, I tried this but I think the ingredients need checking – it comes out as such a thick paste it is impossible to spread it. I can see that the ingredients combined would work, but not in these quantities. Please check your recipe. Hey Wendy, I’m sorry to hear it didn’t turn out well for you. The ingredient quantities are correct. The paste should be thick, but spreadable. But the cream should be thick over the “itchy” area, so it’s like a mask. Can you email me a picture of the final product and how it goes on the skin (if possible): hello@livesimply.me. I would be happy to help you troubleshoot. Ty for this. Question I already have a DIY unscented Shea body butter mixture on hand, can I use this mixture and add the rest of the ingredients to this? (if I use 3TBs to your recipe) It has same ingredients minus the EOs listed. Ty! Hey Jessica, Yes, I believe you can add to the current mixture you have on hand and create a good anti-itch cream. Let me know how it goes! I am super excited to try this recipe out especially with summer coming so soon! Could you give me an idea for the shelf life of this cream? Would you say it would be fine for a year? I try to date all of my creams so that I know when I need to make a new one! Thanks! Hey Aleha, I’ve kept this cream for three months without issue. Due to the baking soda and other ingredients, I would be concerned that it may get hard if it sits for longer, but I could be wrong. Loved the post, thank you! How long can you use this for before it is bad? Hey Katy, Thank you! It should keep for about 6-8 weeks. Hi! I’m excited to try this, do you know if it can be used long term or every day? I have chronic itchy skin and doctors can’t seem to find a solution besides steroid creams, wondering if these ingredients are safe for long term use. Thanks! Hi, I just made a batch of this cream, and I have a history of messing up recipes. Is this supposed to be slightly grainy (I assume because of the baking soda)? Hey Nicole, Yes, it will have a slightly grainy texture. As long as it’s spreadable, you’re good.